Today was a good play day for Lief and I'd like to introduce some of his handmade toys. 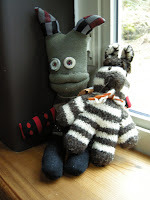 On the left is Oscar, one of the 'Fools Parade' animals, made by Christine and Fiona in Vancouver. I had seen the Fools Parade on display at the Circle Craft Gallery, and though I was tempted to buy one then, I never did. My Mom, Lief and I found Oscar at the Roundhouse Christmas Craft Fair in Vancouver. My Mom decided it would make a great Christmas gift for Lief, so that's how Oscar came to live with us! Next is Kenana Zebra, knitted by rural women in Njoro, Kenya. This group of women buys homespun wool produced locally. They believe in using environmentally friendly and ecologically sustainable materials and processes to support their farming communities in Africa. This was a wonderfully thoughtful gift from one of our friends. Then there's Pull-Raven by Sleeping Forest, from Nova Scotia, which I bought at etsy as a gift for Lief. He drags is around the house (mostly on its side...) and somehow likes to rub the coarse cord on the back of his neck. The beautiful wooden frog is another great gift from my Mom. This one is made by Melissa and Doug and it actually hops along when you pull it, his legs push his back up in the air, quite cute. And these are some wonderful felted and sewn gifts by Ella and Arlo, thank you so much! We really enjoy them, so soft. 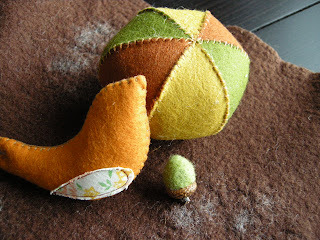 The patterns are great, one day I may even create a mobile with the birdies... Thanks again Ella, very thoughtful! Some yummy yarns from Hands and Notions, I just couldn't resist. So far I've been enjoying their colour and texture, but waiting for a special knitting project asking for these yarns. At the moment I'm into a 'moss' theme, working with a yarn by hobbledehoy. She created a wonderful skein that resonates the feeling of our mossy Alders and Berch. White with patches of blue grays and greens. Jane sent me this wonderful skein of greens and browns, that will go very well with the theme, such a thoughtful and gorgeous gift. You should check out her new Etsy store, her organic cotton wash cloths are divine, so soft. We're back from our travels through warm and sunny Mexico... It's been wonderful, Lief turned out to be quite the little traveler, very adaptable (as all children are of course) and very social. He loved the attention from people and rewarded everyone with a warm smile. Unfortunately we lost our digital camera after two days in Mexico, so I don't have pictures to show... But we ordered one online and found it waiting for us when we got back home. So I got to take a few pictures of Lief outside again. We brought my Mom back from Vancouver to spend a few days with us on the island, which was wonderful. We worked on some projects, while I was knitting a couple of neckwraps she worked in crochet on a pillowcase. I also finished a bag up that was still waiting from before.